Do you have a fun idea to display OUTFOX? Send in your submissions! Contact Us! We were excited to repeat our last year's activity and make the traditional OUTFOX carved pumpkin! This year features a more artistic redition of the FOX. We are displaying it at the 2011 UEA Conference! 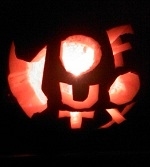 Fun times with OUTFOX during Halloween. The orange pumpkin brought out the OUTFOX colors! Say Hello to Todd Fox! Todd helps us stay up to date with hygiene standards and helps teach hygiene lessons so we can all act responsibly and not get others sick. Draw your pictures of Todd and send them to us! The petition turned out to be a success! You can also see the electronic version of the petition and sign here, on the PASBI Website or on Change.org. We are appreciative of the support that was shown by parents and individuals to bring more health and hygiene training to schools. The sign of the OUTFOX! Do you show support for better hygiene and infection control trainings in schools, hospitals, food services and so forth? You should! Contact us to get a free vinyl FOX sticker and support OUTFOX! This is a picture from the show. OUTFOX representatives worked hard to get better infection control trainings and hygiene lessons plans in the hands of many types of medical professionals during this show. Go OUTFOX! The Utah Foster Care Chalk Art Festival was a lot of fun! We also visited a Freedom Festival, Hard Rock Festival and Venture Outdoors Festival in Salt Lake City. We are excited for Halloween 2011! Also, we are getting ready for the UEA (Utah Education Association) Convention by doing a booth about hand hygiene for teachers. We will have products available, free hygiene posters, free Glo Germ Kits, free Hygiene Manuals, and much more. We are constructing this germ (Peggy Pink Eye) to spruce up the normal 10x10 booth. Wish us luck as we spread the word about infection control! OUTFOX was proud to sponsor the 5k held at Wheeler Farm in Salt Lake City on April 9th 2011 despite the harsh weather conditions! We were very surprised to see an enormous turnout and see all the love and support for health and adoption! Thanks Utah Running Company for setting up the event! This was great to get this from a customer. These pictures were taken at the tradeshow in May 2011. Todd Fox is everywhere! Help him OUTFOX illness and disease today! You can do that by referring people to OUTFOX's hygiene and infection control training materials and other medical products. We all had a great time in the Philippines! It was interesting to investigate another country's hygiene standards! OUTFOX would be extremely busy if all efforts were focused on preventing illness and disease in the Philippines! OUTFOX supporters took some time to hike Mt Olympus to engage in healthy living. Exercise and a healthy lifestyle are crucial for a body's ability to avoid infection and avoid illness and disease. Add hiking to your personal infection control plan!